The internet is the future we seldom imagined. It eluded generations of science fiction writers, only to suddenly appear, fully formed, some time in the mid-1990s, and from then on quickly become an essential part of how most people communicate, research, write and work. Our new present. It is a common experience to ask oneself: how did I do this before? Except before is receding, a not-distant past pushed out of mind by a technological paradigm that is constantly changing the meaning of old, familiar words. Not just what it means to like something or to have friends, but the very act of being social; not just the word ‘memory’ – now reduced to what fits on a microchip, or on the glimmering surface of a hard drive, or in the cloud – but what it’s like to remember. Within that difficulty to recall, or perhaps more accurately to imagine, what life was like before the internet lies the problem of how to conceive of a future without it. It may well be – to paraphrase Fredric Jameson – that it is easier to imagine the end of the world than the end of the internet. Conversely, what is routinely presented as ‘the end of the internet’ turns out to be anything but. Two years ago, the phrase was used to describe the effects of proposed copyright legislation. Nowadays, the spectre is raised about attempts to bring the internet outside of the exclusive control of the United States, the prospect that the principle of net neutrality might be abandoned, or even increased taxation of internet traffic. Anything that might alter the regulatory or technical landscape under which the internet as we know it operates is viewed as a catastrophe, the end. In addition to this, knowing that the internet was originally conceived as a wartime communications network makes us liable to overstate its actual resilience. Neuroscientist David Eagleman, author of the book/app Why the Net Matters, has cited at least four ways the internet could go down. These included political interventions (some will recall Bashar al-Assad shutting down the network in Syria, but there have also been proposals to give American presidents authority over an ‘internet kill switch’); acts of cyber-warfare or sabotage; or the malicious or accidental cutting of deep-sea cables. The fourth reason – space weather – has recently come back into the news and is the most fascinating and chilling of all. It seems that in 2012 we narrowly avoided being hit by a coronal mass ejection from our sun. 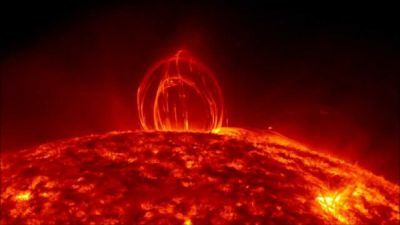 As astronomer Phil Plait explained in a widely shared piece for Slate, a coronal mass ejection is the largest type of solar storm and causes the release of billions of tons of plasma into the solar system. When one of these storms hit the Earth in 1859, it wreaked havoc on the telegraph system – the effects on a more advanced society would (of course) be far greater. Plait predicted widespread, months-long blackouts if large transformers were hit, while Eagleman suggested that a major solar event ‘could theoretically melt down the whole internet’. University of Colorado astronomer Daniel Baker has put the chances of Earth being hit by an ejection of the same magnitude as the one that narrowly missed us in 2012 at 12 per cent over the next decade. ‘That’s a bit higher than makes me comfortable,’ noted Plait wryly. If one sets to one side for a moment the staggering hardship that the sudden collapse of the world’s communications systems would cause, the threat has something of a poetic quality. Large solar storms are relatively frequent, and would have occurred many times since the beginnings of human civilisation. The only different is that now we can notice them; only now do they have the potential to suddenly halt and reverse our technological progress, if not history itself. It is difficult to muster a human response to events that occur on a cosmic scale, but it may be useful nevertheless to reflect on that failure of our collective imagination, since a future without the internet may suddenly displace our present. It may come from the skies, or by executive order. But it could happen. As I have noted in the past, the challenge, as I see it, is to abstract progress from technology. We need to think of our new forms of organisation not as the product of new communication tools, but as our response to them, so that we can teach ourselves to replicate those forms, those networks – which are predominantly social – even without the internet. We should do this not just because we might have to do so some day, but to build a redundancy and to make ourselves more resilient. I also see great value in the recovery of that too-quickly-forgotten past of daily practices and long-term thinking: how we used to communicate, research, write and work. It wasn’t that long ago. I flick a switch and zoom in to my childhood home, which I sold recently after my parents were taken ill. I look into our former backyard and see my father there. I try to get closer but I am repelled by the absolute limits of the zoom function. Dad’s face is duly blurred but he is walking purposefully. There is no sign of the broken hip that made him reliant on a walking frame, no sign of the rapidly advancing symptoms of dementia that now afflicts him. He is frozen in time-sickness. You find yourself in the middle of a long stretch of road. On either side, fields of what looks like young wheat. There are no cars in sight. The sun is shining – isn’t it always? – but of course you aren’t warm. You can choose to proceed in either direction. Eventually you will come to a road sign, or cross paths with a vehicle whose markings might shed some light on your whereabouts. Car plates are illegible so I look out for trucks, which often provide clues such as the address of the company. Trucks can come from quite far away, so the information is no absolute guarantee you’re even in a particular country. It’s just a hint, a clue. Or sometimes you find yourself on the outskirts of a village. When it happens to me, I like to explore the place a little bit before getting down to the business of figuring out its exact location. That is where the pleasure of the game lies: to seek information not from the shop or road signs – which is easy enough – but from the aspect of houses and people. You quickly learn to tell if you’re in a hot country or a temperate one, in a rich town or a poor one. There are unmistakable signs, things we already know at a subconscious level about the shape of people’s lives. 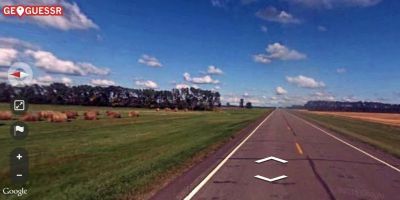 The earliest and most popular game in this genre, GeoGuessr, is nearly as old as Google Street View, on which it is overlaid. There are mobile apps that do the same job, but GeoGuessr is just a website. Every game of GeoGuessr takes you to five locations chosen at random from a given selection, or ‘map’. Some maps are quite specific: you can choose to be transported to urban environments only, or to specific countries. Others span several continents. In any case, after a certain number of moves, you’re going to want to make your guess by placing a pin on the world map at the bottom right corner of the screen. The game will reveal your actual location, and give you points based on the accuracy of your guess. As Street View has evolved and expanded to cover more and more regions of the world in ever-increasing detail, so too GeoGuessr has become more difficult and interesting. Although it is possible to pit yourself against other players, I don’t play competitively, or keep track of my scores. I suspect treating the game as a pastime is the most common approach. Commentators have remarked upon its addictive nature. To me, it is a palimpsest of what the internet could be: a place of places, an infinitely interactive map of the world. A tool for transporting yourself, as opposed to grasping at whatever pieces of detritus happens to gravitate toward the orbit of your interests on any given day. For the internet has a double nature: it connects us across time and space, and in doing so produces the illusion that those distances don’t matter, compressing all of history and geography into the here and now. I click on a link that somebody has shared on Twitter: it speaks of things and in a language I understand, but I don’t always bother to find out who wrote it or where and when. Even if I wanted to, digital content from the first decade of the World Wide Web is seldom even dated, and is often unsigned. Context is the first casualty of our unprecedented capacity to instantly access what seems at times like the entire store of human knowledge. But loss of context also impoverishes that knowledge. Playing GeoGuessr, as I do quite often, I am reminded of these erasures even if the game makes erasures of its own. Africa is very poorly covered at a street level. So is China. But I don’t play the game to be everywhere. I play it to be somewhere. Occasionally, the game takes the player to a location that cannot be guessed. Street View has a surprising number of such places, which are glitch-like in their appearance. You couldn’t access them from the map, so you wonder why they are even there. 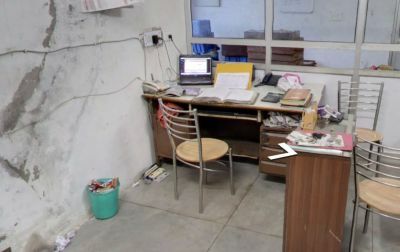 Once, for instance, I found myself inside somebody’s office in New Delhi. Off the reception was a utility room with concrete floors and myriad electric cables. I couldn’t tell what kind of business it was, nor was I able to exit the building and access the street. Another time I ended up in a grass field north-west of Beneficente, Brazil, next to a donkey and some farming implements. I could see a human figure in the distance, but could not get close to it. The frustration of not being able to move past the invisible barriers around me resembled the experience of moving inside a dream. At one level, GeoGuessr is just that: an illusion. It creates the sense of being there – wherever there is – without the means of responding to the environment. It also reflects the limits of Google’s gaze, notably its proclivity to map businesses ahead of everything else. Yet even in the unique way the internet has of turning uncanny experiences into the banal texture of the everyday, the game also acts as a reminder of how vast the world is, and how both similar and dissimilar other people’s lives are to our own. And that is no small thing. The rough translation of frictilia, I suppose, would be ‘fritters’. 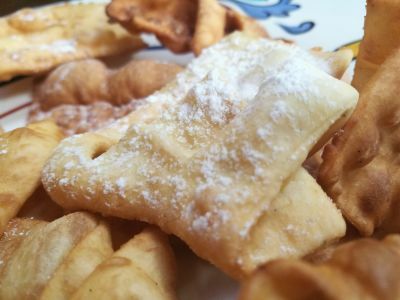 This is the term that ancient Romans used to describe strips of dough fried in lard, a popular treat during the yearly Saturnalia, or feast of Saturn, a direct precursor of the modern carnival. 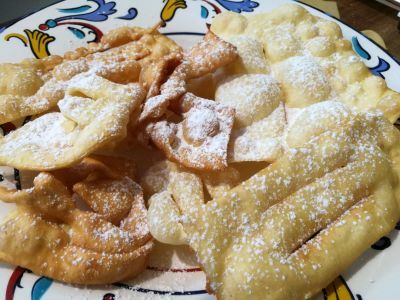 The sweet – which exists in many cultures – has survived in Italy until the present day, with small variations and under an almost bewildering number of regional names, including merveilles (‘marvels’) near the French border, bugie (‘lies’) in Piedmont, frappe in Rome, strufoli or cenci (‘rags) in Tuscany, crostoli in the North-East and from there into Croatia and as far as Poland. 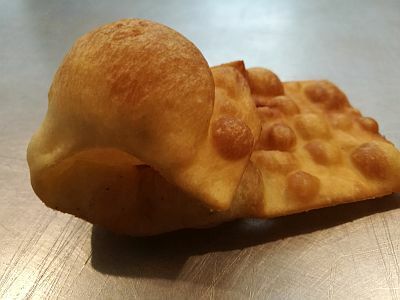 In most other regions they are chiacchiere, or chit-chats. My grandparents lived near Mantua so for my family they were the lattughe, literally lettuce leaves. Nonna made them every Spring and it was one of my favourite sweets but it’s only recently that I tried to re-create them, and only this year that I finally got them exactly right. It’s not because they’re hard to make, on the contrary: but I wasn’t just trying to make any one of the many variants. Rather, the one from my childhood. The one I would recognise. This is a very humble dish. it is not difficult nor expensive to make but it takes labour and time, as befits its origins. As I’ve said many times before, the cuisine of the Mantuan province is historically ‘of the Prince and the pauper’, and festivals in particular required that the same rituals and dishes be accessible by rich and poor alike. None more so, perhaps, than Carnival. 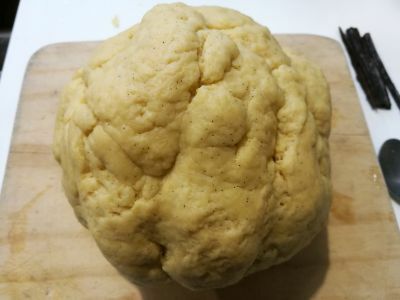 To make lattughe you need to prepare a dough that sits halfway between pasta and pastry: a mixture of eggs and flour enriched with relatively small amounts of butter and sugar and flavoured with lemon peel, Marsala wine and vanilla, which you will then need to roll very thin. 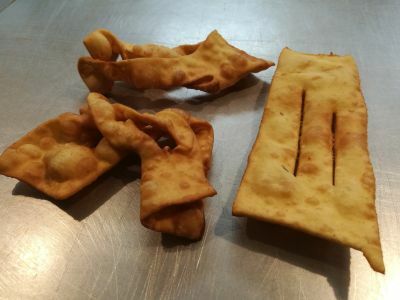 That last aspect in particular is what sets the lattughe apart from other variants, along with the frying in beef dripping – another pauper’s ingredient that is still found in many dishes of this region, including bread. Sift the baking powder and flour, mix with salt and sugar, form a well in the middle in which to break the eggs and add the butter, peel, vanilla and Marsala. Mix, then knead until the dough is hard and smooth. Mine ended up looking not unlike like a cauliflower. Leave it in a bowl covered with a tea towel for half an hour or so. As I made a double batch, I helped myself with a pasta machine to roll it, but you can use a regular pin, so long as you aim for pasta-like thickness. This is more or less what we’re looking for. 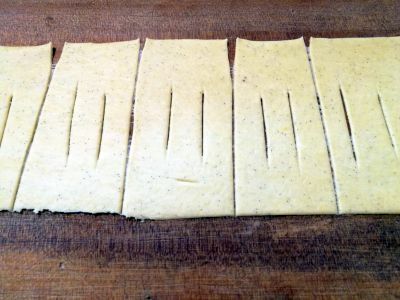 Cut the pasta into strips. The traditional shape is a rectangle of 10x5 cms in size, with two parallel incisions in the middle. You now have the option of feeding one of the corners into the opposite slit, to make a sort of bow – it has no other function than to give some of the lattughe an interesting shape. I did about half that way, the other half I left as rectangles. To cook, heat up the oil or dripping in a saucepan or frying pan. It needs to be hot enough for the dough to cook instantly. 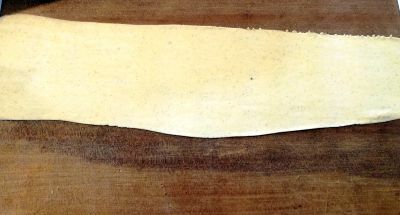 Dunk a strip and count to 4 Mississippis (or, in this case, “Fiume Po”), then turn it over for a split second on the way to taking it out of the pan and into a dish or bowl which you previously lined with a paper towel. They should look something like this. And taste something like this. No wait that’s still how they look. But you know what I mean. 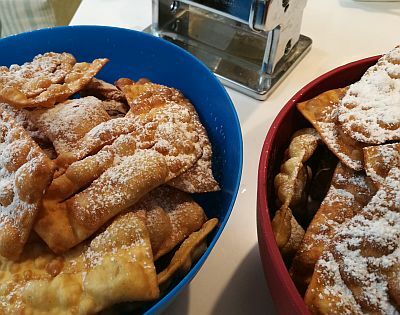 Enjoy, and buon carnevale. Are we running out of poems? Mr Ward is believed to have changed only a handful of words from Miss Mort’s poem, replacing ‘father’ for ‘mother’ in the first line, ‘river Exe’ for ‘Ullapool’ in the second verse and changing the reference to a ‘kingfisher’ near Rannoch Moor in Perthshire, Scotland, to a peregrine falcon on Bossington Beach, Exmoor. I was working on a poem about my childhood experiences in Exmoor and was careless. I used Helen Mort’s poem as a model for my own but rushed and ended up submitting a draft that wasn’t entirely my own work. I had no intention of deliberately plagiarising her work. I have begun to examine my published poems to make sure there are no similar mistakes. Already I have discovered a 2009 poem called The Neighbour is very similar to Tim Dooley’s After Neruda and admit that a mistake has been made. I am still digging and want a fresh start. I can also reveal that whenever I sit down to write an essay or a blog post, I use somebody else’s as a model. Especially if it’s supposed to be about my personal experiences. Then, as soon as I’ve changed enough words, I post it or send it to my editor. Is there any other way? But you really can’t be so careless as to forget to make the changes! Now it seems that Mr Ward may have been equally careless in the past, and so there he is now, at the forefront of the campaign to uncover his own acts of plagiarism, a task for which he seems eminently qualified and can already boast some early success. A further incident last week – involving British ‘poet’ David R Morgan – has prompted the Guardian to come up with the headline, ‘Another plagiarism scandal hits poetry community’. Apparently this ‘community’ is now ‘searching its soul’ and ‘asking itself just how widespread plagiarism is’. I am always doubtful when such sharply defined feelings and intentions are attributed to a vast and diverse group of people, but it may be true that the issue of plagiarism is causing a degree of anxiety that is to some degree peculiar to our times. It’s even got its own, zeitgeisty how-to guide: How to Find Plagiarism in Poetry. It is a variation on a classic contemporary paradox. On the one hand, the internet has greatly increased the human capacity to disseminate texts, including plagiarised ones; on the other, it has given people unprecedented tools for textual matching and analysis over a corpus that – thanks to repositories like Google Books – is approximating the totality of what was published in print before the internet came along, plus all the digital content. Obscure books that could once be trusted to slip further and further into oblivion are now constantly threatening to resurface as searchable texts. You could practically hear them thumping loudly through the plagiarist’s floorboards, like the tell-tale heart in that story by Poe. I don’t intend to ask why we even care, nor the degree in which the idea of authorship is called into question – some years ago, after one of New Zealand’s foremost writers was caught in the act, I proposed using the term ‘authoriety’ to describe its current slippages – but rather reflect on the peculiar character of this anxiety. How it is bound with the fear of being caught doing what we all must, as we engage in that form of serial theft otherwise known as culture. How it ultimately points to the exhaustion of our capacity to say and mean things originally, which is centuries-old and yet always poses itself as new. Perhaps it’s a question that each generation has to ask: are we running out of poems? In 1961 Raymond Queneau tried to answer this question, or rather ensure that humanity would never have cause to ask it again. 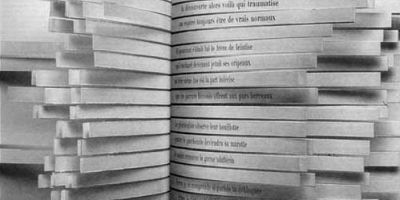 His book, Cent mille milliards de poèmes (sometimes translated as ‘One hundred million million poems’) consisted of ten 14-line sonnets of identical rhyme scheme and matching line endings, with each line printed on an individual strip so as to enable the ‘reader’ to produce up to 10, to the power of 14 different combinations, each one equally valid from a formal point of view, but likely of different semantic and aesthetic value. I never had the pleasure of physically handling the book, but there are a number of websites that strive to replicate the experience in a computational environment (including some in French and English). Ironically, the base-sonnets are protected by copyright, which all the sites are in breach of. Wikipedia tells me that a French court has so decreed. Legalities aside, the problem with Cent mille milliards de poèmes is that it’s very boring. It may be a little nicer to play with the print book, but I found shuffling the lines at the touch of a button (or by hovering over the sonnet) so distracting that I had to stop at once. However, this is in fact a reframing of our media paradox: you can have the statistical certainty that the text you just composed has never been seen in this world before, and it still won’t be your poem, or new, or a piece of art (may Dada forgive me). To do poetry the customary way always involves retreading somebody else’s ground. And that’s fine. If there really is such a thing as a ‘community of poets’, it should worry less about running out of words, or about its capacity to catch the odd thief, whose presence should in fact reassure us that the culture hasn’t reached a dead end; that our canons aren’t yet so small that they can be recited by heart.